The debut 2012 quarterly standings are out for the new USTA Florida 10 and Under Tennis Match Club, where players can earn a year-end colored bag tag inscribed personally with the players name to indicate their club level. USTA Florida will be selecting players for select 10 and under tournaments, such as the USTA Florida State Closed, based exclusively on number of matches played. "USTA Florida is very excited to announce the Match Club for 10 and under players in lieu of 10 and under rankings," said USTA Florida Competitive Tennis Coordinator Andy Gladstone. "The Match Club is a new concept that promotes play by giving incentives to players who play more sanctioned tournament matches in 2012. USTA Florida's decision to disband 10 and under rankings was based on careful research from industry experts who felt there was too much emphasis on winning, and not enough on long-term game development and fun." For more 10 and Under Tennis Match Club info and the full standings, go to www.florida.usta.com/Tournaments/10_and_under_tennis_tournaments/. Hillsborough County adult beginner tennis players received an introduction to round robin play, tennis etiquette and beginner league opportunities during a USTA Florida-hosted 2.5 F.L. (Fun League) Tennis Blast on Saturday, March 31 at Hunter's Green Country Club in Tampa, Fla.
Beginner players are typically rated 2.5 on the USTA League NTRP (National Tennis Rating Program) rating scale. 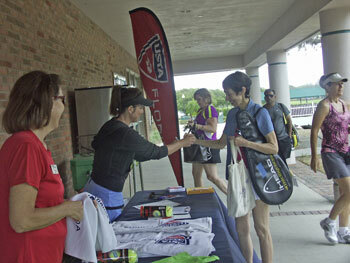 The players were welcomed by Jodi Manning, USTA Florida league coordinator, and Hillsborough Local League Coordinators Sylvie Roy, Alan Williams and Barbara Jones. The 26 players also received lunch and prizes. "The goal of the USTA Florida Blast was to invite adult tennis players, who have had some former play experience, back into the game of tennis," Jones said. "Local professional tennis instructors led drills and a fun round robin was played, with participants having different partners. A lunch was held in the country club restaurant followed by a question and answer period." USTA League is the country's largest recreational tennis league, helping more than 325,000 players nationwide get on the court, have a good time, and step up their game. The League is organized as competitive team match play, with teams made up of a minimum of 5-8 players depending upon division. Teams and matches are set up according to NTRP ratings, so teammates and opponents are at the same skill level, with leagues ranging from the 2.5 beginner level up to 5.0 advanced and Open divisions.